Visoko means high place in Bosnian, and as soon as you visit it, you’ll see where the name comes from. This town, located northwest of Sarajevo, is located in a valley surrounded by green, rolling hills. Visoko, with a population of 46,000 people, is thought to have been part of a Bosnian kingdom during the Medieval Period, and has several points of ancient significance hidden in the lush setting. The Visocica Hills, pyramid-like hill structures, tower 213 meters high and have been the recent focus of hot debate. The Visocica Hills have been studied by Bosnian archaeologist Semir Osmanagic since 2005. Osmanagic, an archaeologist who specializes in pyramids around the world, was drawn to the unusual appearance of the Visocica Hills, which he believes to have all the elements of a true pyramid, including an entrance, flat top, and specific pyramid-like angles. These pyramids’ significance has been the source of recent debate, which makes it even more intriguing for visitors to Bosnia today. In 2006, a series of cut stones were found underneath a massive hill construction. Osmanagic studied this pyramid hill and theorized that these Bosnian pyramids could have been as tall or taller than Egypt’s Great Pyramid of Giza. With no evidence of there ever having been pyramids in Europe, his find could be a breakthrough discovery. 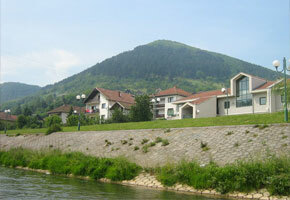 Osmanagic continued by identifying two other pyramid-shaped hills located in Visoko Valley. Together, these ancient structures make up four slopes with an entrance area; similar, Osmanagic believes, to the way pyramids are grouped in Latin America. Recent excavations have uncovered what appear to be plateaus and tunnels, but there is no conclusive evidence that the Visoko hills are, without a doubt, pyramids. Nevertheless, as excavations continue, discoveries are being made that suggest those Bosnian pyramids could be man-made after all. Traveling to Visoko has gotten easier since the discovery of these strange pyramid-like mounds. While the city has retained its quiet appeal and charm, it has become much easier to visit. Park your car at their very convenient parking lots, recently constructed to manage the large influx of visitors to the town. Besides visiting the pyramids of Visoko, you can also sightsee around this picturesque Bosnian town easily. Travel to a beautiful wooden mosque with a wonderfully decorated minaret. While war reconstruction is still being accomplished, the city still contains many red-roofed buildings typical of the area.